A visit to the remote and mostly uninhabited Flinders Island is like stepping back in time. The pace of life here is slower, the locals friendlier, and the air, perhaps the cleanest in the world. Imagine the Bay of Fires meets Wilsons Promontory, and it’s no wonder this was all part of the same mountain range when Tasmania was still joined to the mainland. The Flinders Island walks are so impressive and so breathtakingly gorgeous it’s a wonder that this place remains so unknown. There are rocky coastlines to explore, interspersed with beautiful sandy beaches. There are serene river estuaries and picturesque inlets. And there’s an opportunity to climb the highest peak on the island Mt Strzelecki as well as several smaller peaks. Wildlife abounds too; numerous wallabies (far too many for the locals! ), huge Cape Barren geese, wild peacocks, pheasants, birds of prey and large numbers of seabirds roam unfettered all over the island. Walking amidst the peace and tranquillity on this unspoilt island paradise offers a wonderful panacea to the stresses and strains of modern-day life. We take care of every last detail so you can relax and fully experience this fantastic place on foot. At night freshen up and settle in at your comfortable accommodation. The chef prepared breakfasts and dinners make indulgent bookends to each day. With two excellent guides looking after you, you can pace yourself because we can offer a choice of easier or harder walking options along the way. 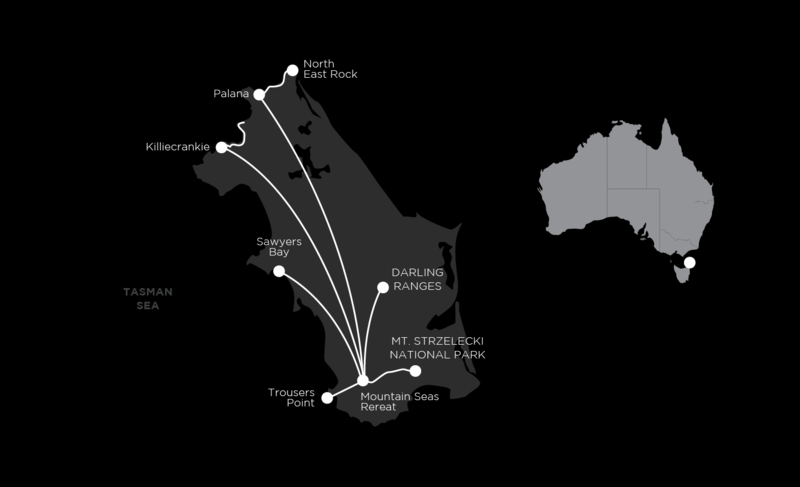 If you’re after a shorter itinerary, then our 4 day Flinders Island Long Weekend trip is for you. As you approach the rugged Furneaux Group of islands, Flinders Island looks like a motley collection of jumbled mountains jutting out of the sea. It’s 75 km long and 40 km wide with a population of only 850 people. As well as tall peaks, sea cliffs and idyllic coves, much of the central part of the island is covered in lush green farmland and glorious national parks. This afternoon, we will endeavour to do a short forest walk at the foot of the Strzelecki Ranges (subject to flight arrival times). On today’s Flinders Island walk we’ll explore the historic Settlement Point area on the west coast of the island. The walking starts at picturesque Sawyers Bay, with some boulder hopping and beach walking. An historic jetty with a magnificent backdrop of the Strzelecki Ranges will have cameras working overtime. We go hiking across the peninsula then along the beach to Castle Rock, a massive granite boulder standing over 15 metres high. On a visit to the Furneaux Historical Museum we’ll learn about Wybalenna, one of the most important Aboriginal historic sites in Australia. It was here in the 1930s that the Tasmanian government resettled what it thought to be the remaining Tasmanian Aboriginal people. At the museum you’ll also learn about early sailors and sealers, the early settlers and the amazing present-day mutton birders. Still on the west side of the island, we head further north today to Mt Killiecrankie. Today’s stunning coastal hike hugs the rocky shores from The Dock to the sleepy fishing settlement of Killiecrankie where we can search for white topaz stones the locals call Killiecrankie diamonds. Orange lichen decorates the granite boulders and the azure blue water beckons swimmers at Stacky’s Bight. Old Man’s Head, a unique rock formation, dominates the southern section of the hike. Finish the afternoon with a peaceful beach walk. Explore the remote northern shores of the island, starting at the idyllic beach at Palana. There is no track as we pick our way along the coast to North East River. Rocky headlands covered in bright orange lichen are interspersed with short stretches of pristine sandy beaches. Be sure to bring your swim gear along. Watching the speed at which the water enters the river estuary at North East River is a highlight. The final hike is in the Darling Range in the central part of the island. Starting at aptly named Walkers Lookout, we traverse a high ridge that offers excellent views in all directions. For fit walkers with a good head for heights there’s an optional ascent of atmospheric Mt Pillinger – known to locals as the Gin Bottle. This holiday Flinders Island tour finishes after breakfast with a transfer to the airport. The Flinders Island walks are diverse but with our expert guides they are relatively easy to negotiate. Full day walks average about 14km. There are opportunities for fit walkers to challenge themselves on two of the days on more difficult walks and optional additional walking. Settle in for six nights at a stunning lodge near Trousers Point and enjoy the Flinders Island walks with the knowledge that a hot shower is waiting for you each day. The property has individually themed rooms, a licensed restaurant, lounge, bar and decks with wonderful views. Expect to be looked after in style. The two course dinners prepared at the lodge restaurant will focus on local fresh organic produce, as the 220 acre property is certified organic. Every day you will wake to a cooked breakfast to ready yourself for the upcoming days walk. You’ll lunch at incredible locations. Indeed, the walkers lunches complete the circle ensuring that your appetite is always kept satisfied. Our walkers lunches are substantial and will provide variety. Lunch is always augmented by Auswalk’s famous trail mix. We provide you with your own insulated lunch bag and a silicon collapsible tub for your convenience. Alcohol and drinks with meals are not included with meals (except tea/coffee and juice with breakfast). The tracks on the Flinders Island walks vary in quality but all are easily navigable. There are well formed tracks and sections where your local guides will have you pick your way along rocky shorelines and sandy beaches. There are some opportunities for fit walkers to challenge themselves but the main walks are all easy to moderate, with the only exception being Mt Strzelecki. This trip operates with two knowledgeable, engaging guides so we can offer easier and harder walk options along the way. If you have any questions about the Flinders Island tour or the walks, feel free to ask one of our destination consultants or to speak with one of our guides. You can get in touch with us via our contact form, email us at info@auswalk.com.au, or call us on +61 3 9597 9767.